Weeks ago I published the recipe for my super-easy cookies 'n' cream dessert. 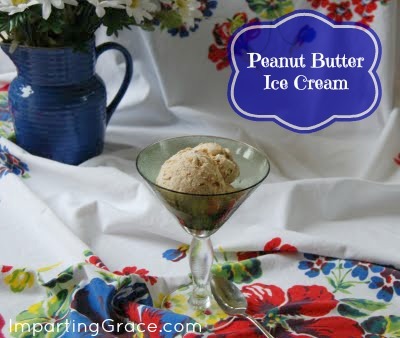 Today I'm going to share with you a variation that my oldest son, Will, and I came up with: peanut butter ice cream dessert. Warning: Save your calories, friends. You are going to want to try this. Crush peanut butter sandwich cookies. (We use a zip-top bag and a rolling pin to do this.) Soften Cool Whip and ice cream slightly, just enough so that they're stirrable. Place Cool Whip and ice cream in a large mixer bowl. Add vanilla and mix thoroughly. Stir in peanut butter to taste: we used three heaping tablespoons. Mix in crushed cookies. Spoon into serving dish and freeze until hard enough to scoop. Want to come sit with me on my porch and have some? I'd love to have you! My husband would love this! He has chocolate peanut butter ice cream almost every night with extra peanut butter stirred in. This looks terrific! I'd love to join you on the porch and eat so e of the yummy Peanut Butter dessert. May I have seconds? Yum! 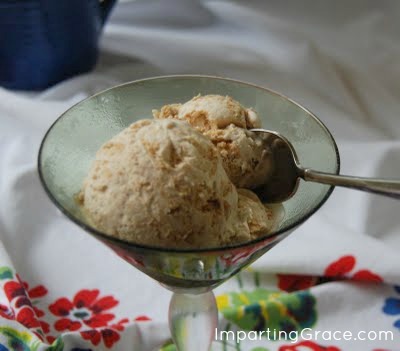 Peanut butter ice cream is one of my favorites, and mixing in peanut butter cookies just makes it even better! Mmmmm! This looks and sounds wonderful! Thank you for sharing! wow this sounds so yummy! My 10 year old has just started getting into baking and made some peanut butter cookies this week that the whole family loved, I will have to show her this icecream recipe! It would be a good back to school icecream treat! Sounds like a fabulous and happy dessert to suprise my DH with for his birthday in a couple weeks. Thanks for sharing with us Richella. Have to tell you the DH loves peanut butter so this will be a sweet surprise for him. We decided many years ago not to exchange gifts and to only give things from the heart. He has made me such sweet homemade cards. I will treasure them always. They mean more to me than any thing he could buy from the store! But this year is in the bag....YOU RECIPE!!! Thank you so much sweet friend.